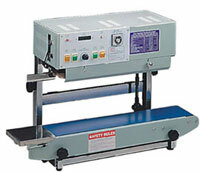 This portable vertical band sealer is ideal for the sealing and packaging of items such as powders, liquids, and grains. Bags are sealed in a standing position which avoids any spillage of the product. The conveyor speed can be adjusted to 40ft. per minute also the height and heat can be adjusted to accommodate most sealing applications. This vertical band sealer comes equipped with a repair kit.